We may quibble all day long about procedurals relevant to the eating of Mexican food in Austin. After all it’s fun breaking down the numerous components that have to be factored in when you’re evaluating the deliciousness of your meal. Olmeca’s turns a very neat trick in serving lard free beans that have maximum flavor. The beans themselves are long simmered pintos, not cooked into a paste but actually served fairly loose. As in, you could eat a bowl of them with a spoon as a soup. I ask for corn tortillas and receive a memorably good version. A single corn tortilla, rolled with a pin to almost transparency but nonetheless filled with a good corny flavor. Offered a choice between red and green salsas I opt for the green which the counter lady has informed me is the spicier option. It’s a tomatilla base and is indeed hot with fiery notes of serrano and plentiful onion. Two cheeses ornament the taco, a white and a yellow. Each is good but most importantly they have been freshly grated with a gorgeous sheen on each frond of cheese. A small statement of deliciousness to be sure but an important one. At $1.40 Olmeca’s provides a very good value. This bean and cheese taco is sincere with all necessary elements put firmly in place by a talented cook. Atmosphere at the restaurant runs towards the dim. The rheostat is receiving some good work here as the room is quite dark. 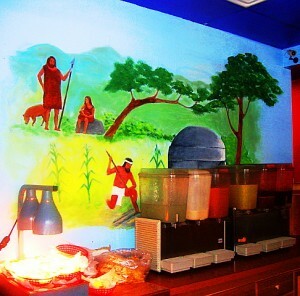 Numerous Mexican painting fill the walls save one which features a giant television screen posted up high giving a theater feel to the bar section. The owners definitely have a sense of whimsy as is evidenced by the giant mushroom table up front and the caveman painting on the back wall near the bubbling fountain drink station. but I can assure you that there is no finer place to start than with their first rate bean and cheese taco.